Is this the very definition of irony (maybe more the Alanis Morissette kind than the dictionary-definition kind)? 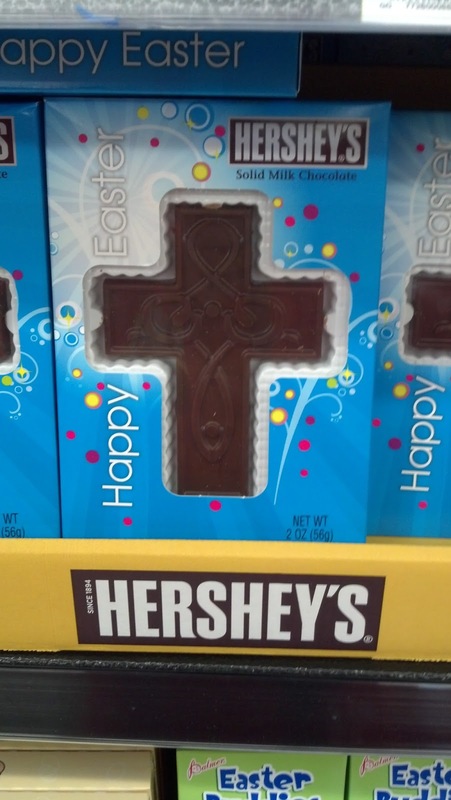 The cross–the means of the Jesus’ torture and death–turned into delicious milk chocolate. I’m not sure if I should be depressed that a sacred symbol has been reduced to a chocolate treat, or if I should be happy that there’s an Easter product that still has some kind of a connection to the reason we celebrate Easter. America doesn’t have a Christian culture anymore. It has an irreligious culture with flecks of Christianity still stuck to it. So, I’m going to consider it a win that, in a long aisle of eggs and bunnies and peeps, there was one explicitly Christian symbol. But still, it seems like it would be weird to eat a cross and say, “Mmm, that’s a good cross.” Or to say to your kids, “Put that cross down before you ruin your dinner.” Or, “If you don’t finish your broccoli, you can’t have any cross.” Seems like that would kind of diminish the significance of the symbol. Well, anyway, I’m still considering it a win, because I take ’em where I can get ’em. I hope everybody gets sweet, sweet crosses this Easter.